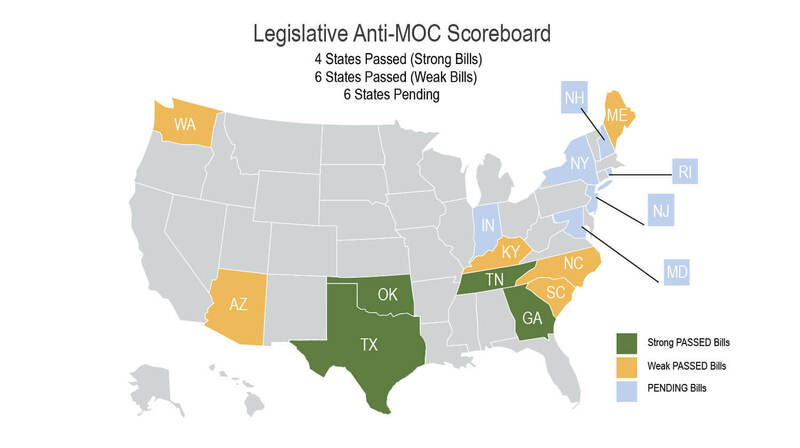 Several states now have anti-MOC legislation pending. Recently the Georgia legislature passed HB 165, similar to Oklahoma’s SB 1148, which prohibits Maintenance of Certification (MOC) as a condition of licensure or reimbursement from third parties. However, the ABMS and its member boards have been heavily lobbying state legislators to defeat the pending bills. Those of us opposed to MOC must educate the legislators in these states regarding how MOC requirements are onerous, expensive, have no proven benefit, and are forced on physicians by conflicted, self-appointed private ABMS member boards. The following are instructions to help you make the best use of the NBPAS anti-MOC advocacy materials. This is a short slide deck intended for use with legislators and other non-medical stake holders. It defines some of the basic anti-MOC issues and makes a strong argument against MOC. It is designed for a small or large meeting with state representative. Note: Some slides may need you to “click” to display all the animations. The commentary version’s slides have a small “speaker” icon in the lower right corner. If you click on the “play” icon, you will hear Dr. Teirstein commenting on the specific slide. The comments are designed to help explain the slide and enhance your understanding of the material. This is a PDF document that duplicates the above PowerPoint presentation. It can be handed out instead of the PowerPoint if a computer presentation is not practical and/or left with the stakeholder after your meeting. This is a comprehensive presentation designed for a hospital grand rounds or MEC presentation. This list provides links to key publications relating to MOC. It is NOT intended to be exhaustive, rather it contains enough material for you to be comfortable presenting some of the primary data. Each entry has a description of the publication’s key points. A 14 minute video of Dr Teirstein’s side of a debate against the CEO of the ABMS at the fall meeting of the California Medical Association: This video contains much of the PowerPoint in #3 above and will provide some context that may aid in your own presentation. A 30 minute video of Dr. Teirstein’s side of a debate against the CEO of the ABIM and the CEO of the ABIM at the Fall 2015 meeting of the Association of Professor’s in Medicine. This video also contains much of the PowerPoint in #3 above and will provide some context that may aid in your own presentation. Please also look at the News page of NBPAS.org for more academic and lay press articles about MOC. Thank you for helping us spread the word about the National Board of Physicians and Surgeons. We want to assist you spread the word in every way possible. See below for a sample letter and petition you can use. A sample letter to send to your medstaff, MEC, Administrators and Payers asking them to accept NBPAS certification as an alternative to ABMS or AOA member board certification for hospital privileges. A sample petition to sent to your entire medical staff asking your hospital’s Credentials Committee and MEC to accept NBPAS certification as an alternative to ABMS or AOA member board certification for hospital privileges.